The theme of these contemporary ukiyo-e is Mt. Fuji, the symbol of Japan. This majestic mountain, which was inscribed on the List of World Cultural Heritage Sites in 2013, has been the subject of ukiyo-e and many other arts since olden times. These works are based on a painting that Ms. Kusama created in a moment of inspiration when, during her first encounter with Mt. Fuji at close range, she was totally captivated by the mountain. 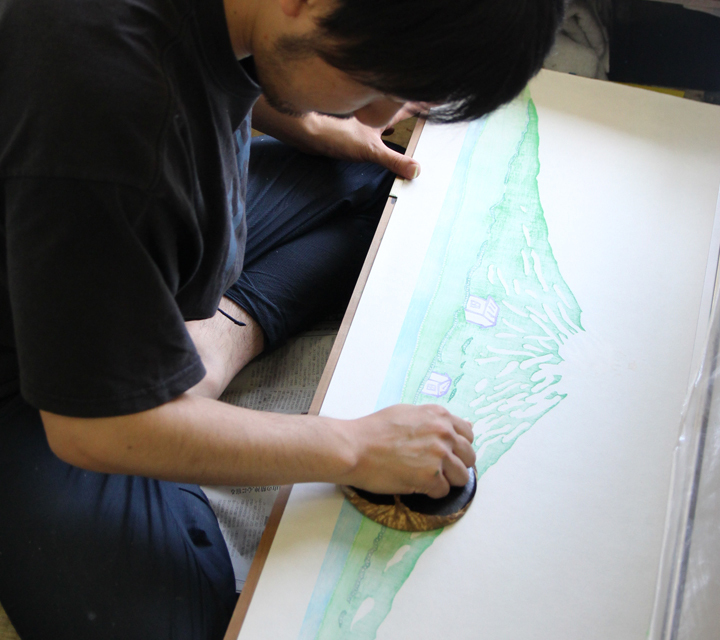 The artworks depict Mt. Fuji's exceptional life force and its majestic solo summit by highlighting the mountain's broad base and soaring peak. 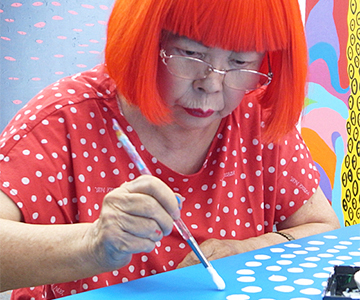 Yayoi Kusama, the "Queen of the Polka Dot," fills in the blue sky with countless polka dots as she paints with single-minded concentration. The carver shows his skill by giving each polka dot a unique character. 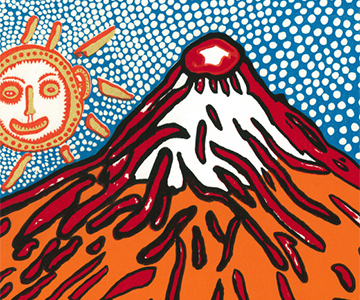 This woodblock is the result of the carver's immersion of himself in the polka dots and his merging with Ms. Kusama's painting as he felt her brushwork. The blue sky has 14,685 polka dots, Ms. Kusama's trademark. The bold brushstrokes used to depict the outline of Mt. Fuji communicate the majesty of the mountain. 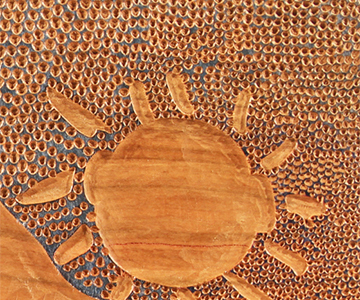 Solid gold is used in the happily smiling sun to give it a golden glow. 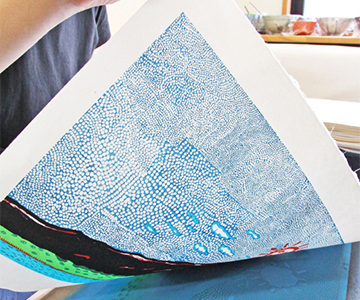 The printer makes each print using vivid colours blended by the printer -a unique feature of woodcut prints. 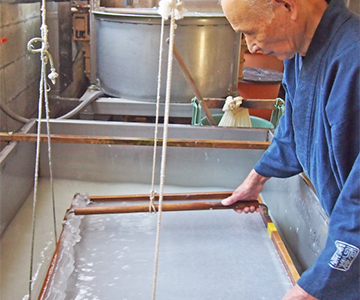 Ichibei Iwano, a living national treasure, specially makes Echizen kizuki hosho washi (a unique kind of Japanese paper) in the maximum size. 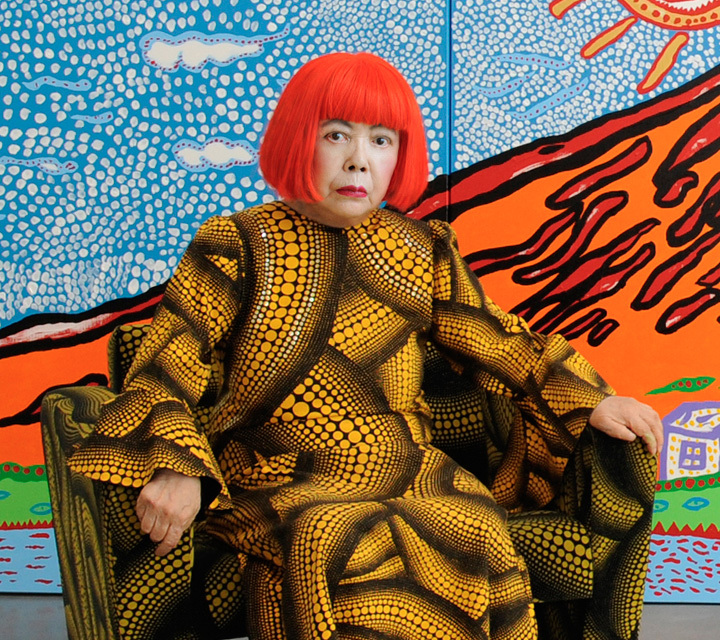 Ms. Kusama is known as the "Queen of the Polka Dot." For her, the polka dot pattern symbolizes self-obliteration as she becomes immersed in the endlessly multiplying polka dots. 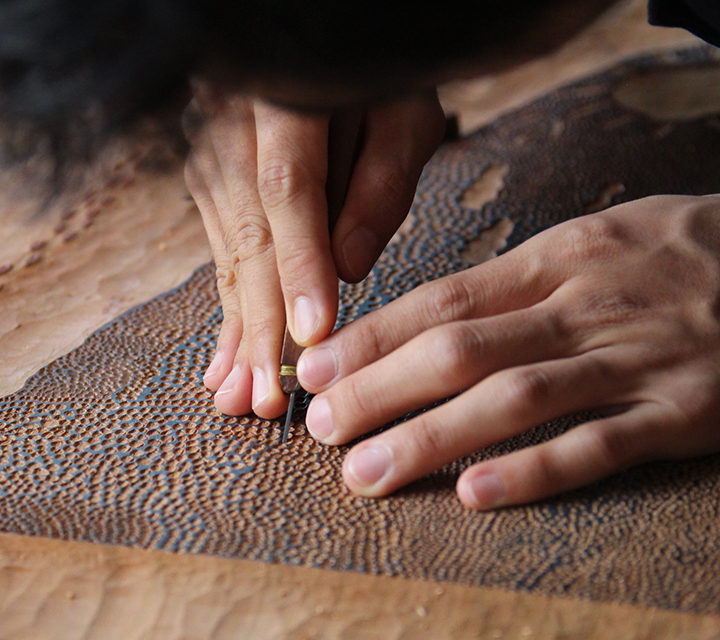 Chikura Kishi is the young Adachi carver whose task was to carve the 14,685 polka dots that make up the sky. He created the woodblock by immersing himself in the polka dots and merging with the painting as he felt Ms. Kusama's brushwork in the uniqueness of each dot. Ms. Kusama always tries to create something new that exceeds the imagination. 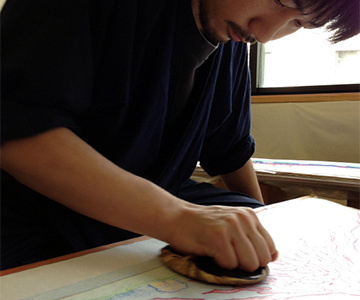 In step with this aim, the Adachi Institute decided to depict Mt. Fuji in seven different hues. 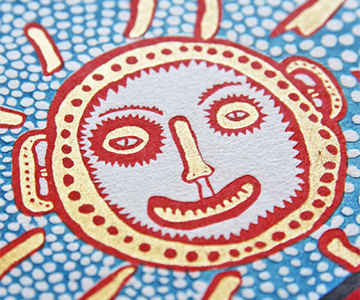 Woodcut prints are known for their vivid colours. Inspired by the bright colours created by Yoshio Kyoso, a young Adachi printer, Ms. Kusama composed a poem for the artworks on the spot. 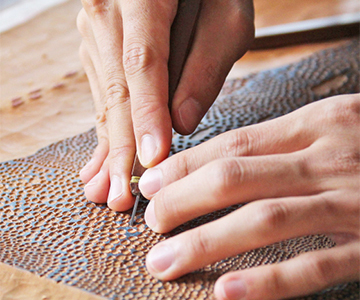 In this and other ways, this collaboration gave birth to new creative explorations. Each of the seven colours gives Mt. Fuji a different expression. Regarding "Mt. Fuji in Seven Colours", as we expect high volume of orders, you can only register for one color. RPlease pick one color and note it in your order.